In the age of the digital boom, the company’s and client’s information, as well as documents, are increasingly all over the enterprise. Creating confusion and delay. But the way we manage, collaborate, and approve content should be always the same. Sharing and collaborating on documents in one centralized location is a great tool for any company with multiple departments. 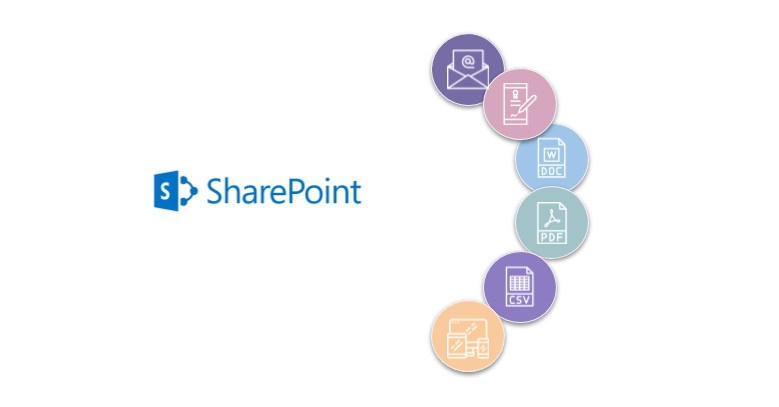 That’s exactly what Microsoft SharePoint offers, a content management system that allows teams to set up a secure and centralized space for document sharing. SharePoint does come with a variety of built-in features, but it only offers a narrow spectrum of document editing and approval workflow-related features. Document creation isn’t always a linear process as it can go through a number of revisions and approval process before it is completed. Once it’s completed, we can always imagine some additional, conditional, and/or optional processes being performed on it. Based on our findings, here are several reasons why companies should invest in professional document creation and template management solution. Wouldn’t it be nice if your employees were able to share and capture customers information by producing different document formats? This is quite useful when it comes to documents that require correct information and customers signature. One example would be to produce a PDF fillable form with e-signature feature embedded for faster document execution. As an example, industries which would benefit from their employees to have access to produce different document types are insurance and finance. Just imagine having your team out on the field collecting customer information without a need to print and retype any information. Simply create a fillable PDF form and collect the required information. We bet that you can relay to the times when your pre-printed document was missing some information that you had to manually “pen-in”. Now, would it be nice to just add missing information on the go with the post-creation process that allows your team to input any information without compromising already pre-approved information? The best example of the post-creation process would be an estimate or quote that was provided to the customer. When there is an item that was missed and instead of re-creating the entire document, your team member could simply add the missing information and produce new copy for the clients’ review. How many times have you looked for the same information like your customer’s address for example and had to re-type it into your newly created document? Tasks like that take time and reduce performance. By reusing already once entered data in your system saves time and reduces user’s workload and it also ensures that the document has the most up to date accurate information. A perfect example of reusing data from your system would be invoicing customers. There is so much information that can be pre-filled for the user to allow them to focus on the accuracy of the billable items and timely execution of the invoice to the customer. There is nothing worse than searching for the most up to date document or working on something for the longest time but then finding out that the document that you have worked on is no longer accurate or compliant. Pre-approved templates are the best way to reduce human error, ensure that the documents that are being used are most up to date and compliant. They also protect the company’s image as the documents are always accurate and error free. How many people does it take to produce your monthly customer invoices? Recurring document creation could take days if not weeks for the user to create even with already pre-filled information. With bulk document creation, users can simply select the documents that need to be automatically created on a specific date and the system does it for them. Like invoices or statements. How many times have your team searched different documents to compile all the necessary up to date customer’s information? Different documents like insurance policies, loan documents, invoices, quotes, and other customer-related documents could have different information depending on when and by whom they have been entered. Merging all that data from different SharePoint sources into one document could ensure accuracy and promote efficiency amongst your team. Several companies advertise their services as experts in custom configuration and proper training however users want easy configuration and minimal training to operate any new system. It already takes months to years to fully configure out of the box SharePoint but if you need additional functionalities, your users should not be required to spend additional months to learn it. Users feel most comfortable with systems that are user-friendly, that won’t create problems if they click on something wrong, and the company’s IT team should be able to troubleshoot small issues before reaching out to the experts. How many times have you found a mistake or asked your fellow team members not to make changes to some documents? How many times you had to revise already once revised document because someone else started to make changes? Department heads love the idea that after the document template is created they can lock parts of that document to prevent unwanted future revisions. The best example would be a legal notice that has to follow specific structure and regulations, a small change to the document could cost the company a small fortune. So go ahead and lock those heavily regulated documents. New employees or interns sending documents to your customers? Are you confident that what they have prepared is accurate? Implementing document approval and workflow could be something that your department managers and supervisors need to avoid some embarrassing and costly mistakes that your new staff could cause. Before your team is hailed a “seasoned” employee, they have to go through some training to ensure that they fully comprehend all their assigned tasks. With document approval and workflow, their work could be checked before it goes live. There could be one or several approvers, and they all could be assigned through a workflow that alerts them when a pending review document is in their inbox. How many times have you seen a job posting that was open for months at a time due to one requirement – knowledge of a legacy system? The biggest problem that the companies are facing is finding experienced people to work with their legacy systems. Retrieving and inputting data to and from the legacy system is not effective and time-consuming. The younger generation of workforce feels uncomfortable and unwilling to work with “old” legacy systems which really narrows down the recruiters’ search for the right fit. One area that still deals with this problem is in the Public Sector where thousands of paper forms need to be generated and once completed they need to be manually entered into the legacy system. Adding two-way legacy system connection would eliminate manual labor and improve productivity and recruiters job while searching for the replacement of staff. With the document creation and template management solution you can automate the creation of virtually any document you regularly use in SharePoint. And it is exactly what we wanted to point out here in this article. Ultimately, automation will produce a more consistent structure for your SharePoint and promote smoother working performance. So, if you have a reason or reasons to believe that your organization would benefit from the document creation and template management solution, give us a call. We can listen and advise you on the right solution that would help you and your organization shine!